Trailing 10-6 of the eve of the Ryder Cup singles in Brookline 1999, US captain Ben Crenshaw turned to the then Governor of Texas for help. George W. Bush can chalk up inspiring the US to their most famous Ryder Cup win as one of his many successes (?). The Ryder Cup is a magnet for A-list American politicians. Seasoned Ryder Cup watchers would often see the likes of George Bush Senior nattering with the captain, riding around on a buggy as part of the US team entourage. (Bush the elder is a wheelchair-bound 92 year old now so might struggle to be as prominent this weekend). Crenshaw was from Austin, Texas, and was, unsurprisingly, a personal friend of Bush on that account. W. was already on the campaign trail at this point, chasing the Republican nomination for President. He was eventually sucked into a dogfight with John McCain for the nomination, a battle from which he would emerge victorious. He was in the Ryder Cup crowd with his brother Jeb and had long known of his central role on the Saturday night. It had been planned long before the US found themselves deep in a hole after two days play. But the circumstances of the evening made the address even more fitting. Bush walked into a room full of the players and their wives and read out the letter sent by Col. William Travis requesting aid and refusing to surrender before the Battle of the Alamo. *Of course, Travis and his entire garrison at the Alamo were annihilated by the Mexicans before help could arrive but that's probably a pedantic point. I am besieged, by a thousand or more Mexicans under Santa Anna. I have sustained continual bombardment and cannonade for 24 hours and have not lost a man. The enemy has demanded a surrender at discretion, otherwise, the garrison are to be put to the sword, if the fort is taken. I have answered the demand with a canon shot, and our flag still waves proudly from the walls. I shall never surrender or retreat. Then, I call on you in the name of liberty, of patriotism and of everything dear to the American character, to come to our aid, with all dispatch. The enemy is receiving reinforcements daily and will no doubt increase to three or four thousand in four or five days. If this call is neglected, I am determined to sustain myself as long as possible and die like a soldier who never forgets what is due to his own honour and that of his country. After reading out the address, Bush later told Golf Digest that he "wished the players godspeed", told them the country was behind them, and then promptly left the room without sticking around for a chat. Wheeling out the future President wasn't the only motivational trick the captain held in reserve. The Ryder Cup has its own rich history of relying on dressing room wall material. The US team's press officer handed Crenshaw a note before his team-talk. "I'm gonna share this with the team," he announced. The note claimed that Colin Montgomerie had said the competition was "all over." The only problem with the quote is that there's no proof Monty ever said it. "I'm gonna leave ya'll with one thought and then I'm gonna leave. I'm a big believer in fate... I have a good feeling about this." 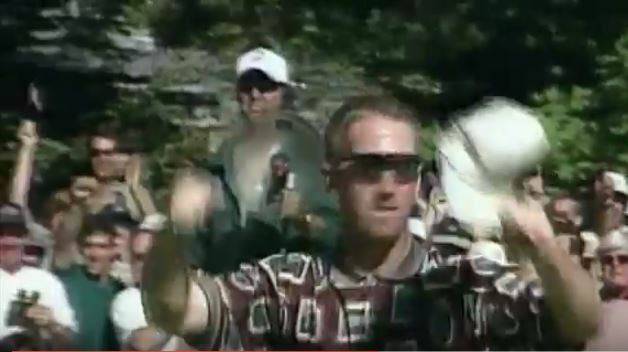 The 1999 Ryder Cup showcases US golf at its most pumped-up, nationalistic, Republican-inclined. The stereotype has it that nearly all pro-golfers swing to the right. The stereotype has a sound basis. Prior to the 1993 Ryder Cup, a surly clique within the US team initially refused to meet with Bill Clinton before the event. Billo, like more of less all US Presidents, was an avid golf fan and was eager to wish the team well. The team weren't eager to receive his good wishes. Captain Tom Watson - rather more successful in '93 than he would be two decades later - had to smooth things over, guilting the players into showing proper respect for "the First Golfer". The controversy was detailed in John Feinstein's book 'A Good Walk Spoiled'. It's not just taxes either. Evangelical types are nicely represented on tour, the aforementioned Lee Janzen being numbered among them. Christian evangelicals have little time for Democrats at the best of times, at least since Jimmy Carter let them all down in the late 70s. But they reserved a special contempt for Clinton for obvious reasons. Tom Lehman, who really let himself go on that Ryder Cup Sunday, was another devoted evangelical, a fact which Sam Torrance would throw back in his face once it had all simmered down. In the past two decades, PGA tour players have donated three times as much money to Republican candidates as Democratic candidates. And topping the league table in donations to Republican politicians on the PGA tour is none other than Ben Crenshaw. "On paper, they should be caddying for us"
USA were coming off the back of two straight losses but they boasted far more star power in their line-up. They weren't shy about saying it either. "On paper, they should be caddying for us," sneered Payne Stewart in early August. Continuing their recent tradition of making a hames of the opening day, the US were 6-2 down after the Friday. More fodder for the theory that these cocky American individualists don't gel well together in pairings. Their would-be caddies were leading them a merry dance. They failed to eat into Europe's lead on Saturday. They were still down by 4. No team had ever overturned such a deficit on the final day. One thing they had going for them was their record in the singles. Back then, the US had a reputation, which they've rather blown in the 21st century, for turning the screw in the Sunday singles. Even in Valderama in '97, where they lost 14 1/2 to 13 1/2, they began the final day five points behind, and almost pulled it out of the fire on the last day. Also, European captain Mark James had taken a gamble by giving three of his unheralded lads no golf at all on Friday and Saturday. Jarmo Sandelin, Andrew Coltart, and 72nd hole comedy superstar Jean Van de Velde didn't play at all in the first two days. The singles match would be their only appearance. Paul Lawrie told Golf Digest some years ago that the lads took it well. In the team room Friday night, James apologized to the three guys who hadn't played that day and said, "I'm really sorry, but it doesn't look like you'll play tomorrow. We're doing well. I don't want to break anybody up." There was silence. Then Jarmo says, "That's OK, but if you don't play me Sunday [mandatory for singles play], I'll be really pissed." Broke up the entire room. "I've never seen so much red..."
Seeing the match-ups on the Sunday morning sent a shiver down some European spines. Jesper Parnevik, one of Europe's most successful performers on the opening two days, later confessed that he couldn't see where Europe were going to pick up the 4 1/2 points. They weren't even much heartened by the bizarre US outfits, which consisted of portraits of winning US teams from down the years. Designing the outfits is, believe it or not, one of the key responsibilities of the captain, and Crenshaw touchingly remarked that a lot of thought went into those shirts. The BBC thought them hilarious. The big thing about that Ryder Cup Sunday in '99 was how quickly the US managed to turn the tournament upside down. James had sent his under-cooked rookies out all in a group at No. 3, 4, 5. This was deemed a boo-boo by seasoned Ryder Cup watchers. Unhappily for Europe, they were lined up against America's biggest names. Sandelin was lined up against Phil Mickelson, Van de Velde had to play Davis Love, while poor old Coltart was assigned to meet Tiger Woods. All three were well beaten with Van de Velde being walloped 6 and 5 by Love. Worse still, America were winning in the opening two, more even matched, games. Dancing Tom Lehman, who charged around the green punching the air, after one birdie was cantering ahead of Lee Westwood. A devout Christian, like so many on the tour, Lehman was singled out for special opprobrium by the Europeans after it was all over, with Sam Torrance dubbing him "a madman". In match 2, dear old Hal Sutton was in inspired form against Clarke. No game summed up the about-turn in fortunes better than the sixth match. David Duval, then at his zenith as a golfer and sitting at No. 1 in the world, was lined up with Jesper Parnevik on the European side. In the first two days, Parnevik had accumulated 3 and 1/2 points. His pairing with Garcia worked like a dream. They were the stars of the competition. By contrast, Duval's form had been dismal. He mustered just a 1/2 point from three matches. To European eyes and ears, Duval, a divisive figure with golf fans, embodied the stereotype of the individualist American golfer failing to acclimatise to a team event. On the Sunday, the famously inscrutable Duval was a fireball of emotion, charging around the greens and clenching his fists after nailing putts. He destroyed the in-form Parnevik 5 and 4. Out of the first six matches, the Americans were ahead in all of them. European players beginning further down the order had been told, "Don't look at the scoreboard!" Paul Lawrie couldn't stop himself. "I've never seen so much red", he told Golf Digest's Roundtable a few years back. "Some of the spectators behaved like animals..."
The crowd was growing extremely raucous. They were dosed up on patriotic fervour. Chants of "USA, USA, USA" echoed around the course. According to the Europeans, this was partly whipped up by the American players themselves. Sir Michael Bonnallack, veteran English golf administrator, was badly out of his element among the galleries in Brookline. He accused the US players of "baying" the spectators. The crowd, he claimed, were deliberately encouraged to cheer every missed European putt, and every effort was made to create an intimidating environment. He even went so far as to say that it was "noisier and far worse than being at a soccer match." The final insult. Colin Montgomerie, Europe's most high-profile player, and a man who'd already blown a few Majors on American soil, was getting the worst of it. He'd spent years rubbing the Yanks up the wrong way. It came to a head in Brookline. His American nickname "Mrs. Doubtfire" was yelled plenty. As was "Shank it, you fat pig!" His father found the whole thing too difficult to listen to and left the course well before the end. 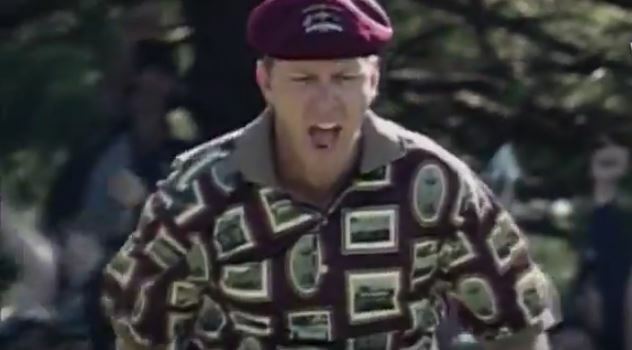 Before reaching the 4th tee, Payne Stewart, hitherto regarded as the avatar of obnoxious US arrogance, pulled Monty aside and told him to come to him if there was any more abuse and he'd hail down the referees. On the 5th, some yahoo roared abuse on Montgomerie's backswing and Stewart made good on his word. He confronted the crowd, informed the referees and the guilty party was ejected. There were rumours of yet more skulduggery. Andrew Coltart, gamely trying to keep touch with Woods, managed to lose a ball in area patrolled by four or five marshals. After ferreting around for five minutes, they were informed their time was up. Coltart traveled back to hit his tee shot again. According to Coltart's coach, the marshals began high-fiving each other when the search was called off. After banging his second tee shot down the fairway, the first ball miraculously appeared. To this day, Coltart's caddie insists that one of the marshals was standing on the ball. It remains a matter of conjecture. Down the final stretch, only Paul Lawrie, Monty, Jose Maria Olazabal, and Harrington were holding firm againt the avalanche. Garcia was being badly beaten by Jim Furyk while Jimenez was struggling against Steve Pate. It looked like the best Europe could do was secure a 14-14 tie. They'd retain the trophy a la Christy O'Connor in 1989. Harrington won a titanic contest with the off-form Mark O'Meara, brilliantly holing out for birdie on the 18th. He'd been 1 down coming up 17 but managed to win the final two holes. Had the Europeans clung on, this result would surely have been hailed as decisive. Alas, Mr. Crenshaw's gut proved to be on the money. Justin Leonard, in shocking form all weekend, advised to stay home on the couch by US broadcaster Johnny Miller, starting holing a series of monster putts and rallied from four down to whittle down Jose Maria Olazabal's lead to nothing. By 17, he'd drawn level. It was 14-12 to the Americans. Only a half was required to win. We know what transpired on 17. Leonard holed another mammoth putt, prompting a mass green invasion by the jubilant American team and their wives. They all forgot that Olazabal still had a putt to keep the match alive. After coming to his senses, Crenshaw, who'd been an enthusiastic green invader, realised the situation and belatedly tried to calm people down. Olly's face wore a look of disgust. Still, as he admitted later on, no one trampled on his line. But still, they had caused grave offence to the God of etiquette. It was a difficult putt. Unsurpisingly, he missed it to the left. The Americans now had permission to begin their celebration. Crenshaw bent down and kissed the green repeatedly. In his post-victory interview, he cast his eyes skywards and used the word 'fate' again. The European team, most especially the staff, were furious. Vice-captain Sam Torrance was the most strident. It was the most disgraceful and disgusting day in the history of professional golf. The spectators behaved like animals and some of the American players, most notably Tom Lehman, acted like madmen. Torrance later wrote in his autobiography of a telephone exchange between him and Lehman. I saw you run 50 yards from the 17th green back down the fairway and stand in front of the crowd fist-pumping at them as if in a frenzy. I watched you, I saw you. And what I said was that your behaviour was not that of a man of God. There was dead silence for maybe 10 seconds before he replied. I remember his exact words. 'Sam, you make a good point and I apologise from the bottom of my heart'." Even the native press had a pop at their team's manners. The Los Angeles Times said the American team had broken every rule of "golf decorum". The Washington Post were even more cutting. "It seems an American team can't get through an international competition without acting like jackasses at some point." "Ya'll have been a bad marriage partner..."
The American players clambered up on the clubhouse roof and sprayed champagne over the ecstatic crowds. The party dragged on forever. Payne Stewart danced on top of a piano. That night would be the last many of his teammates and fellow pros would see of him. Hal 'Halimony' Sutton, now on his fourth wife but committed to sobriety and clean living, announced that even he would "down a shot for this team", a spectacle which generated the biggest roar of the evening. Even Tiger Woods was pulled from his bed to take part in the revelry. Subsequent Ryder Cups were more genteel affairs. The Americans got such a telling off after Brookline that they resolved to be on their best behaviour going forward. Naturally, some have wondered whether this might account for their often insipid performances in the years since. Perhaps, the competition could do with a return of some of the spirit of '99? If only to convince the sceptics that the American players really care about the competition. Five years after '99, the Europeans returned to States for the Ryder Cup, this time in Oakland Hills. 'Halimony' was in the captain's buggy for the Americans this time around. Not to be too cutting but as his nickname implied, he knew a thing or two about difficult marriages. He for one was tired of the Europeans constant bitching about Brookline in '99. "Look, y'all have been kind of like a bad marriage partner. We've apologised for five years for what happened in 1999. So y'all need to forget about that. No more apologies or anything else." Read more: "We've Created This Role In Our Imagination" - Is The Ryder Cup Captain That Important?